NASA's Mars rover Curiosity has delivered the first Martian dirt sample to its onboard chemistry laboratory, testing out gear that forms the scientific heart of the $2.5 billion robot. Curiosity's huge robotic arm dropped a pinch of Red Planet dirt into the rover's Sample Analysis at Mars instrument, or SAM. SAM can detect organic compounds — the carbon-containing building blocks of life as we know it — and is thus key to Curiosity's mission, which seeks to determine if Mars has ever been capable of supporting microbial life. 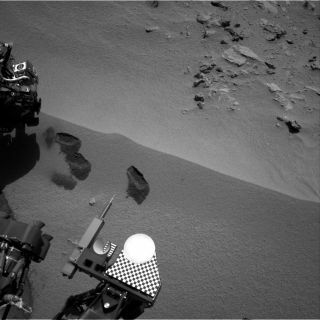 SAM ingested its first soil sample on Friday (Nov. 9) at a sandy site the rover team has dubbed Rocknest. The instrument analyzed the dirt over the following two days using mass spectrometry, gas chromatography and laser spectrometry, researchers said. "We received good data from this first solid sample," SAM principal investigator Paul Mahaffy, of NASA's Goddard Space Flight Center in Greenbelt, Md., said in a statement. "We have a lot of data analysis to do, and we are planning to get additional samples of Rocknest material to add confidence about what we learn." While last Friday's activities kicked off SAM's soil analyses, the instrument had already sniffed the Martian air several times in a search for methane, a gas commonly produced by living organisms here on Earth. The first few sniffs revealed no methane, scientists announced earlier this month, adding that Curiosity will keep hunting for the gas. The 1-ton Mars rover Curiosity landed Aug. 5 inside Mars' huge Gale Crater, initiating a two-year prime mission. The six-wheeled robot carries 10 different instruments, but SAM takes up more than half of Curiosity's science payload by weight. SAM and the Chemistry & Mineralogy instrument, or CheMin, both sit inside Curiosity's body and are designed to analyze soil samples delivered by the rover's 7.1-foot-long (2.1 meters) robotic arm. CheMin has already studied Martian soil and received a fresh sample from the same scoop that fed SAM, scientists said.